Ganesha Stove Distribution in Rasnalu, March 2018. Note flat pack of the stove for pre-positioning and ease of transport. The only way to understand how Nepalis use the Ganesha stove is to put them into the hands of villagers across the country, and then study the impacts. We worked together with six NGO partners to initiate pilot projects in 8 different villages. Distribution of stoves began in April 2018, and evaluation of these projects began in May 2018. 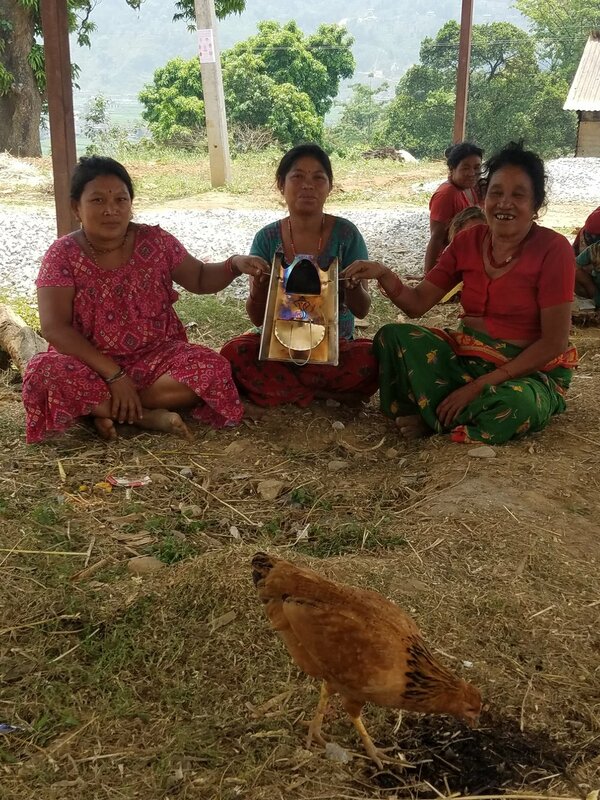 The first delivery of stoves occurred when PACT Nepal distributed 50 Ganesha stoves in the remote village of Rasnalu in Ramechhap district, Nepal (above). This village is primarily Sunuwar, a marginalized group in Nepal that cooks almost exclusively with firewood. Assembling Ganesha stoves in Majhigaon, April 2018. Assembly takes less than 5 minutes. After assembly, the stove supports 200 lbs (90 kg). BSP Nepal distributed 50 stoves in the minority village of Majhigaon in Sindhupalchowk district, Nepal. This community has still not recovered from the 2015 earthquakes, due to their lack of income and low social status. Ganesha stove assembly. Kukri knife not required! PACT Nepal distributed 50 Ganesha stoves in the village of Kalinchok in Dolakha district, Nepal, peopled by the ethnic Thami minority. Stove distribution site in Dhunkharka, May 2018. Centre for Rural Technology distributed 10 stoves to the remote Dhunkharka, Nepal in May 2018. This is an Eco-Village Development project, where users will be interviewed periodically to see how well they liked their stoves, how much they used them, and the kinds and level of impact. Each user had to pay their local municipality NRs 500 (about US$5) for the stove, and they can return the stove if they don't like it. The Usability Survey Report for this pilot project is available here. IM Swedish Development Partner and their local partner, MADE-Nepal distributed 40 Ganesha stoves to Gorkha, Nepal and 40 Ganesha stoves to the Nawalparasi Hills, Nepal. PLAN International distributed 100 Ganesha stoves to low-caste single mothers in Dhorpatan Municipality, Nepal in June 2018.